Stems: Erect, usually unbranched, sparsely to densely pubescent. Leaves: Alternate, numerous, simple, very short-stalked, lanceolate to narrowly ovate, 1.5 to 7 inches long, 1 to 2 inches wide, finely hairy above, woolly below; margins toothed; tips tapering to points. Inflorescences: Irregular, loose clusters of numerous heads; immature and mature heads often together in same inflorescence; heads about 1/2 inch wide; bracts overlapping, purplish to greenish brown, tips pointed, spreading or curving back and downward. Flowers: Ray florets absent; disk florets 17-34, reddish purple. Fruits: Achenes, tiny, ribbed, tipped with brownish purple bristles, enclosing small seed. Habitat: Dry or heavily grazed pastures, open upland sites, disturbed areas, and roadsides. Forage Value: This plant is very bitter and is not consumed by cattle, though sheep will eat it. 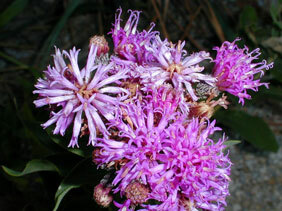 Comments: Western ironweed is one of the most common pasture weeds in Kansas. It will increase in overgrazed grasslands.